The world's 5 most valuable companies: Apple, Google, Microsoft, Amazon, Facebook. 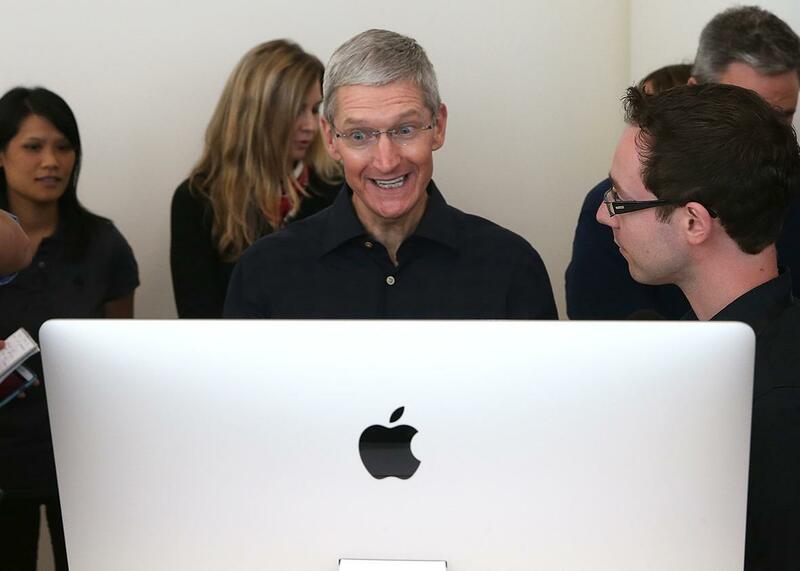 Apple’s Tim Cook, pictured on Oct. 16, 2014, in Cupertino, California. Most days, Exxon Mobil is one of the three or four most valuable companies in the world. But on Friday morning, something remarkable and perhaps unprecedented happened. Fresh from reporting blockbuster earnings this week, both Amazon and Facebook eclipsed the petroleum giant in market capitalization. So why is that noteworthy? 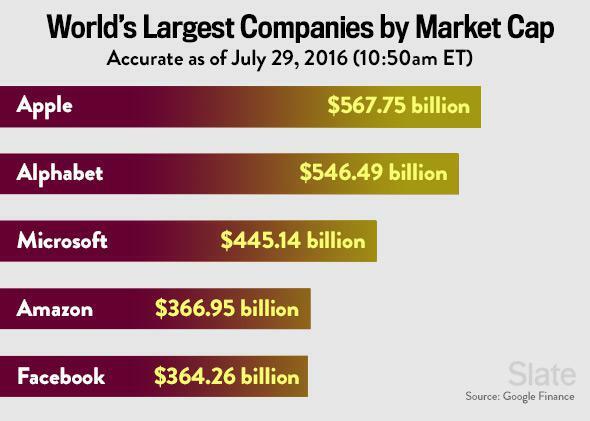 Because it meant that, for at least a short time, the five largest companies in the world by market cap were all technology companies. Silicon Valley, Silicon Valley, Seattle, Seattle, Silicon Valley. Exxon was sixth, Berkshire Hathaway seventh. To be clear, this leaderboard in itself has no direct impact on, well, anything, other than public perception. No one gets a prize for ranking at the top of it, nor a penalty for dropping down the list. And “most valuable,” in this context, doesn’t mean the company that produces the most value for the world, or even makes the most money. It’s simply the company whose stock is worth the most, when you multiply its share price by the total number of outstanding shares. Still, it feels like a cultural moment to see what are sometimes called the “big five” U.S. tech companies surpass all others in market value. The outspoken venture capitalist Marc Andreessen declared back in 2011 that “software is eating the world.” While that’s a hard claim to define or validate empirically, a chart like the one above seems like pretty compelling anecdotal evidence—if not that software has eaten the world, then at least that investors are convinced it will. Is this the first time in history that the top five has been all tech? It’s hard to prove, but it seems plausible, given that Exxon Mobil in particular has been a mainstay on that list since before the first tech boom in the 1990s. Berkshire Hathaway, PetroChina, General Electric, and Walmart, among others, have all shared a top-five ranking with Exxon Mobil for long stretches over the past 20 years. Before that, the information technology industry was relatively nascent. The moment was fleeting, as it turned out. Facebook’s stock gave back some of its recent surge, and Exxon’s regained its footing to pull back into fifth place by midday. By 3:15 p.m. ET, Exxon had drawn nearly even with Amazon, too. It’s worth recalling that this moment comes almost five years after it became fashionable among industry observers to declare that we were witnessing a second tech bubble. And perhaps we still are! But if so, it has turned out to be a rather durable one.